Like the ephemeral French marigold flowers in her mother's garden, Eriko lives only for herself. 'I'm not that lonely, I kind of like being by myself' she says. And like the flowers she wasn't blooming last year. But then she meets Tamura and everything changes. 'I hoped summer wouldn't come, but i love this season now'. 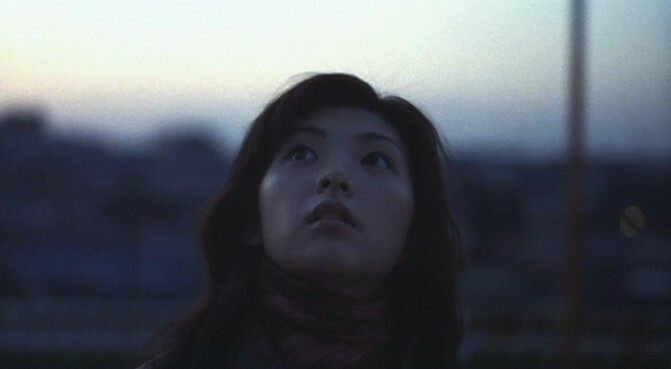 Rena Tanaka plays Eriko, a quiet girl living with her mother and working meaningless jobs. She meets Tamura (Yukiyoshi Ozawa) at a work party, and they start going out. She later finds out he has a girlfriend who is studying abroad. So she asks him, to be her boyfriend for just one year, until his girlfriend returns. He agrees, and they even rent an apartment together. But of course they have the Damocles' sword of the other girlfriend returning hanging over their heads, forcing Eriko to realize what she really wants from life. The story appears simple enough but take a closer look and you'll see the richness and complexity… in particular, the character of Eriko. Is her loneliness real or is it that society expects her to be lonely? Does she truly want a boyfriend or is her clinging on to him an act of conformism, filling a gap in her life that in reality isn't there? Either way, as the story progresses she really starts to depend on Tamura. Buying a cell phone to stay in touch with him, this is a key moment in the film. My favorite scene is when he's away on a business trip, Eriko lethargically lying on the floor of their apartment talking to herself: 'i cant live', 'i can't live without you', 'i can't stay alive'. And in the most touching and finest-acted scene of the film, she literally begs him to continue the relationship. The ending is interesting. Earlier, an old friend (Yoichiro Saito, EUREKA) asked her to play a small part in a TV commercial. When she is watching herself in the finished commercial over and over and crying with joy, it's the ultimate moment of emancipation and realization. 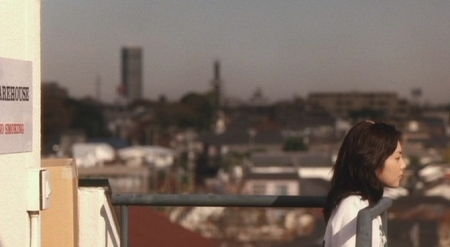 Directed by Jun Ichikawa, TOKYO MARIGOLD is one of the most stylistically harmonic films i have seen. The quit and understated music, dreamy photography, slow tempo, scarce dialogue, and sober color scheme it all blends together perfectly. The music in particular is amazing. Knowing its place it fluently adjusts to every tonal shift of the story instead of dictating them. Everything works, nothing stands out. Perfect. Region 2, ntsc, oar 1.85:1, 16:9 enhanced, film-sourced. Dolby digital mono sound, Japanese with optional English subtitles. Picture quality is okay at best. Edge enhancement artifacts are visible, but I’ve seen worse. Black level is too high, unforgivable for a film as dark as this one. The scene in the karaoke bar suffers the most. Shadow detail could be better. Biggest problem is extreme chroma delay. If you don't know what to look for, just check out the left edge of the picture, in every bright scene there's a blurry blue halo alongside it. But it's just as visible in the picture area, and it's really distracting. This and the black level problem are typical for bandai releases. I really hope they'll get their act together soon, because they release great films that deserve much better transfers. Oh and the picture is also slightly window boxed, so you loose some resolution. The weird thing is the window boxing is uneven, with more black on one side than on the other. They also rounded the corners, like a viewfinder. Very odd. And finally the picture is quite noisy, and there is some brightness fluctuation like you sometimes see in pre-1950s films. But that looks more like a film stock issue. There are some nice extras. Besides the usual stuff like interviews and trailers there's a great location map. There are ten or so locations, and when you click on them you get video footage from the way it looks now, with spoken commentary by Rena. And there are (what feels like) four million commercials for Ajinomoto soup starring Rena and Kiki Kirin who plays both her mother in the film and in these commercials. All extras are video-sourced and in Japanese with no subtitles.